Location: Situated sone 300m N of bridge over Hoffnant where lanes from Penbryn, Sarnau, Brynhoffnant and Pongarret meet. 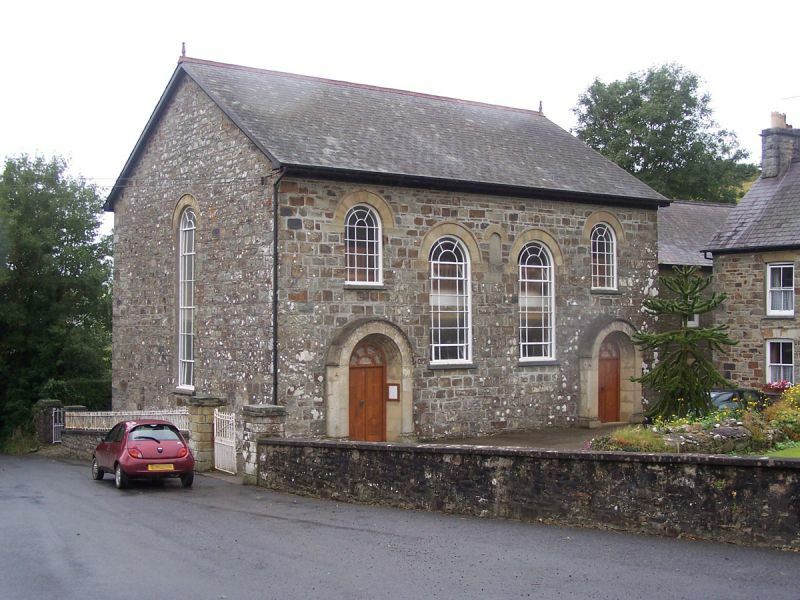 1846 Calvinistic Methodist chapel remodelled 1939. First chapel on site was built 1786. Squared Pwntan sandstone with pale sandstone dressings and slate roof. Lateral facade with two large arched centre windows, arched date plaque between and two smaller arched gallery windows over two arched doors. Windows have 1939 metal tracery with marginal glazing bars and radiating-bar heads. Doors have 1939 panelled double doors with leaded fanlights and stained wood radiating bars. 1939 heavy arched porches in reconstituted stone with chamfered piers, moulded arch underside and hoodmoulded coping. Two storey later C19 vestry and schoolroom to right with yellow brick heads to cambered-headed 4-pane sashes. Rear wall has pulpit projection probably of 1939 with two arched windows and long arched window each side. Interior: Unusually complete interior of 1939 with extensive panelling. Deep coffered ceiling with eight main rectangular panels and narrow framing panels, the main panels with planted rectangular panels in darker wood, rebated at angles. Cantilevered gallery, five-sided with panelled front and planted rebated-corner rectangles in each panel. Oak pews and big curvedcornered great seat. Pulpit platform projects from rear recess, which has dado panelling. Pulpit front is panelled with planted strips of dark wood in modern style. Behind pulpit is narrow 1957 organ and two stained glass windows of c1939 signed William Morris & Co, Westminster. Coloured glass borders are echoed in sides of leaded lights to half-glazed doors in corner entrance lobbies. Wood panelling to lobbies and similar to gallery undersides. Included primarily for fine 1939 interior, a rare example of this date. Situated just W of Troedyrhow, on W side of enclosed farm court, end-on to slope. Situated in circular hillside churchyard to W of Hoffnant valley some 500m inland from Penbryn beach. Situated on S side of A 487 just W of Sarnau village, opposite village sign.